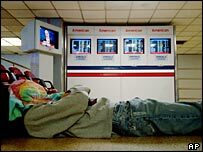 The US is deploying extra air marshals on flights between the UK and the US after Britain said it had foiled a plot to blow up planes to the US. The White House said the plot had been a "direct threat" to the US and the top US security official said aspects of it were "suggestive of... al-Qaeda". The US has raised the terror alert to red, its highest level, for commercial flights from the UK. Air passengers have been barred from carrying liquids in hand luggage. Michael Chertoff, US director of homeland security, said the idea had been to detonate liquid explosives on board multiple commercial aircraft. Some measures "which are not visible"
Unnamed US officials said the airlines targeted were United, American and Continental. 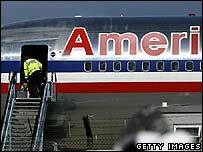 The plot was aimed at flights to New York, Washington and California, US officials said. US President George W Bush discussed the plot "in recent days" with British Prime Minister Tony Blair, according to White House spokesman Tony Snow. President Bush is to make a statement at 1545 GMT. "This is an ongoing investigation that will play out over several days and weeks," Mr Snow said. This is the first time the US government has raised the threat level to red for flights coming in from another country. The alert level for all domestic and other international flights has been raised to orange, the next-highest level. 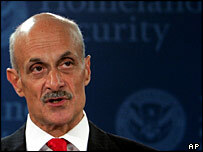 The plot was "about as sophisticated as we have seen", said Mr Chertoff. Declining to say how closely linked to al-Qaeda the suspects were, he said there was no evidence of plotting within the US and that the raising of alert levels was "a precaution". "Prudence suggests that we treat [the route between the UK and US] as being at the highest level of threat," he told a news conference. "We don't have any specific reason to believe that there is a threat to other routes of air travel, but we don't necessarily know everything." He said air marshals would continue to operate "all over the world" but that extra resources would be deployed on the UK-US route. An air marshal is an undercover armed guard on board a commercial aircraft to counter hijackings and other hostile acts. The US has more than 1,000 air marshals, a Homeland Security spokeswoman told the BBC. She refused to say how many were being shifted to the UK-US route. Travellers in the US have also been told to expect extra security measures at airports. A number of European airlines have already suspended flights into Heathrow airport and passengers in the UK are not being allowed to take hand luggage on to flights.